Early in 2013, we made the final decision to create a new fall seasonal. The choice of what style to brew, what it should taste like, how to brew it, what to call it, and what the label should look like are five of the most delightful assignments anyone could have at a brewery—aside from sampling the finished product! A small team was organized to collaborate on these “tasks.” The result is BigLeaf Maple Autumn Red. The first decision was beer style. My recommendation to our team was red ale, which we’d never brewed before and yet, for color, flavor, and history, seemed well suited to the season and to us. “But maybe it would be more fun to make a red ale with an Anchor twist,” mused one member of the team. “What if we added maple syrup in the brewkettle?” We had used maple syrup at Anchor before, so it seemed a logical and tasty choice. 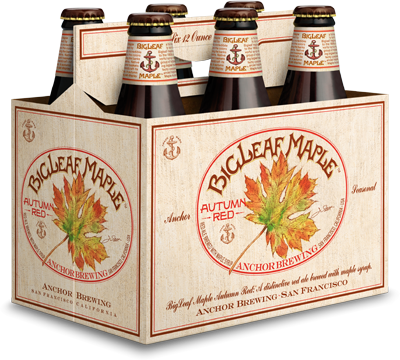 But, I wondered, was maple syrup more east coast than west coast, more Vermont than California, more Brewery X or Y than Anchor? 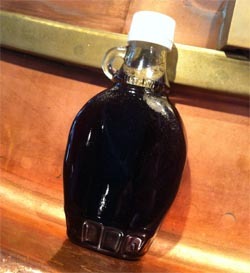 Wouldn’t it be great to find a distinctly west-coast maple syrup to use in our new brew? Research began with a great old book, which I’d used before for our Christmas Ales. 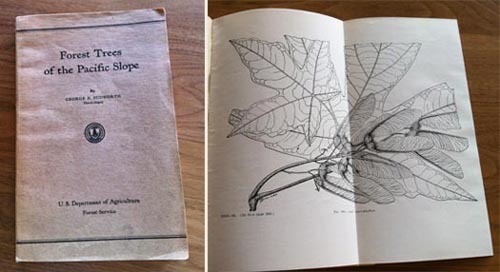 Written in 1908, it’s called Forest Trees of the Pacific Slope. Long story short, the bigleaf maple (Acer macrophyllum) is a native California tree, which only grows within about 150 miles of the west coast. And there is a long tradition of bigleaf maple sugaring, from California to British Columbia. As early as 1888, in an article entitled “California Maple Sugar,” the Pacific Rural Press touted the “excellent quality” and “true maple flavor” of this promising product. Despite the enthusiasm of 19th-century western agriculturalists, though, bigleaf maple syrup never caught on, except among a small group of dedicated west-coast hobbyists. 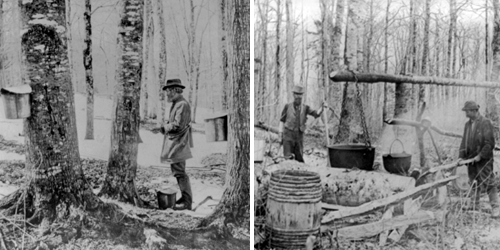 It’s called maple sugaring whether you are making sugar or syrup from the sap of a maple tree. First, the tree is tapped by drilling a small hole into it and inserting a spile (a sort of Zwickel for trees). The sap (about 2% sugar for bigleaf maples, 3% for eastern sugar maples) runs out of the spile into a bucket, from which it is collected and boiled until the sugar content is about 66.5% and you have yourself some bigleaf maple syrup! This syrup is as supremely and uniquely delicious as it is rare. I offered a taste to each member of our team. All agreed that it would not only be the best west-coast ingredient for our red ale but that its flavors could inspire the malt and hop character of the brew itself. It was brewmaster Mark Carpenter’s idea to use a blend of hops rather than just one hop for dry hopping our red ale and the result is a rich, big, complex aroma that perfectly complements the flavors and aromas of the syrup we’d sampled. Although it was late in the sugaring season, I was lucky to be able to track down just enough bigleaf maple syrup for us to use in every brew. 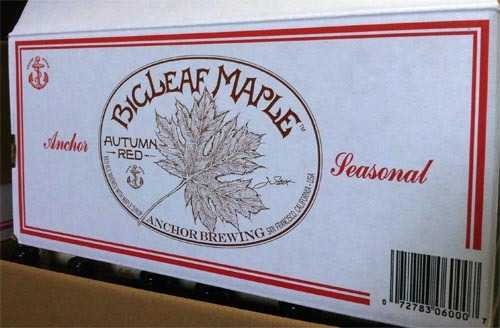 Fortunately, “Bigleaf Maple” was also the perfect name for our “autumn red” ale. So we had the syrup. We had the recipe. We had the name. On to the label! And on to visit Jim Stitt, who has been designing labels for us since the early 1970s. I discussed the beer and its label with Jim, emphasizing how important it was that the leaf be featured quite prominently but at an angle, so as not to confuse it with the iconic leaf on Canada’s flag. 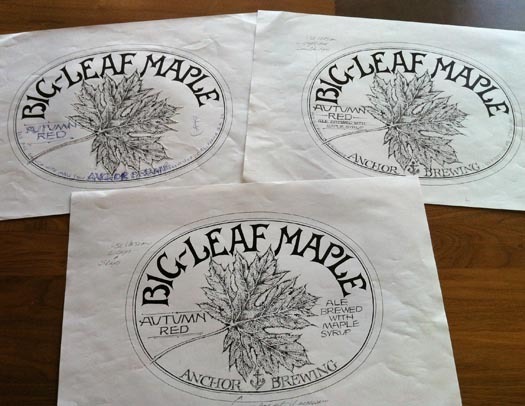 And, of course, I wanted him to hand letter the label’s rolling header: “BigLeaf Maple.” As usual with Jim, he got it right away and was already sketching while we talked. As I began work on the story for the neck label, Jim began work on the leaf, intricately, painstakingly, and beautifully drawing it at a size much larger than it would ultimately appear on the label. 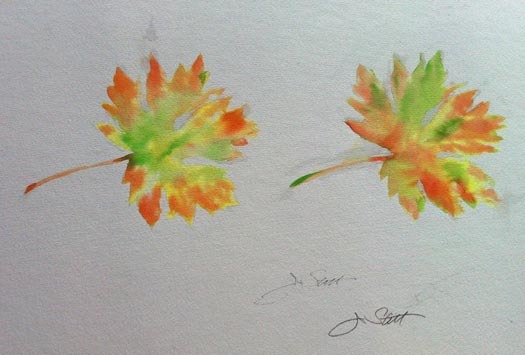 Next Jim created in watercolor the multi-colored look of a bigleaf leaf caught in the act of turning. Overlaying the pen-and-ink drawing onto the watercolor created just the effect we hoped it would. As the label took shape, I asked Jim if he would sign it, which, although he’d never signed a label for us before, seemed particularly fitting for this unique work of art, which would grace everything from bottle to case. Jim has always believed that a label is like a little poster. And I’m a firm believer that if a poster design isn’t convincing in one color it probably won’t work much better in full color. So during the design process we kept the label, except for the leaf, in black and white until the artwork and layout, following a helpful leaf suggestion (note how the stem “breaks” the oval border) from a member of our team, was nearly complete. We could then rest assured that the label would look good in one color on a case and in many colors on a bottle. Next, Jim and I picked a brown and a red. For a label background color, it seemed logical to use a light cream color to contrast with the colors of the leaf, the BIGLEAF MAPLE brown, and the AUTUMN RED red. Somehow, though, the label needed more texture. I wanted it to look almost as if Jim had drawn it directly onto the stump of a bigleaf maple tree. 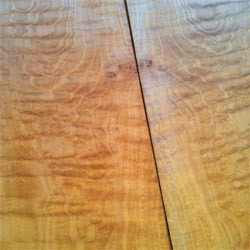 I contacted a guitar maker, who sent me two pieces of bigleaf maple for the backside of a guitar. The texture worked great but was still too “clean” and flat looking. Ultimately, it was an actual piece of bigleaf maple burl, which I got from a woodworking shop, that provided the unusually organic background for our label and for our 6-pack. Many thanks to our magnificent photographer Kirk and our equally magnificent graphic designer Elaine, who helped me transform this burl and Jim’s original art into packaging reality. 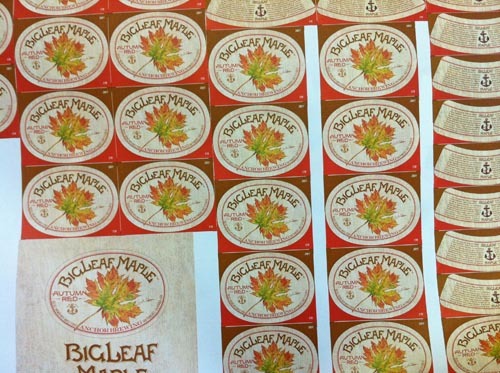 At long last, with anticipation building for our first BigLeaf bottling, it was off to the label printer, who prints the labels many “up” on a 40”–wide press sheet. After die cutting, packaging, and delivery to the brewery, the labels were as ready as we were for a cold bottle of beer! Special thanks and kudos to Jim Stitt for his incomparable artistry, vast experience, and keen insight. 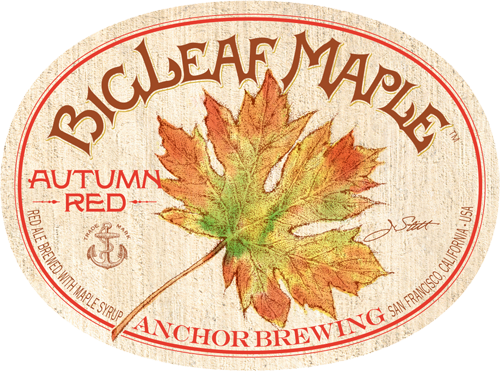 But finally, especially since reading blogs about beer makes us all so darn thirsty, thanks to Mark Carpenter and the Anchor brewers for our deliciously new fall seasonal, BigLeaf Maple Autumn Red. Cheers to a great team! I would love to save one or two of your beautiful labels as this is one my favorite fall seasonals. Gorgeous design and delicious beer. Thanks, Anchor!